In 1989, the National Council of Teachers of Mathematics (NCTM) published the Principles and Standards, which advocated a problem-solving approach for the teaching and learning of mathematics. Thoughtful application of this approach, however is still relatively uncommon in U.S. classrooms. Analysis of the TIMSS videotape study revealed that Japanese math lessons embodied the spirit of the NCTM Standards more than American lessons. How could this be, given that NCTM is a U.S. organization? It turns out that while American teachers were still trying to make sense of the standards, Japanese teachers were studying how to make them come alive in their classrooms through lesson study. Another nation that took the NCTM Standards and other research on problem-based approaches seriously is Singapore. After its independence in 1965, Singapore realized that without any natural resources it would have to rely on human capital for success, so they embarked on an effort to develop a highly educated citizenry. Various education reforms were initiated and in 1980 the Curriculum Development Institute was established, which developed the Primary Mathematics program. This program was based on the concrete, pictorial, abstract approach. This approach, founded on the work of renowned cognitive American psychologist Jerome Bruner, encourages mathematical problem solving, thinking and communication. The fact that problem solving is the central idea in Singapore math can be seen in the pentagon from Singapore's Mathematics Framework below. The Framework states, "Mathematical problem solving is central to mathematics learning. It involves the acquisition and application of mathematics concepts and skills in a wide range of situations, including non-routine, open-ended and real-world problems. The development of mathematical problem solving ability is dependent on five inter-related components, namely, Concepts, Skills, Processes, Attitudes and Metacognition." After a brief warm up with multiplication and division flash cards, the teacher introduces a problem by saying, "Our friend Meihua has some toy soldiers. She wants to put them equally in some tents." (Note that no numbers are mentioned and there is no question asked yet.) The teacher then asks the students to try to imagine the situation and discuss what it means to put the soldiers in tents equally. Students share examples such as, "If she has 15 soldiers and 3 tents, she could put 5 soldiers in each tent," and "If there were 10 soldiers and 5 tents she could put 2 soldiers in each tent." Next, the teacher gives the students 14 counters (chips) to represent the soldiers and 4 cups to represent the tents. Then she poses the problem, "Meihua has 14 toy soldiers. She puts the toy soldiers equally into 4 tents. How many soldiers are there in each tent? How many soldiers are left?" Students begin solving the problem by dividing the counters among the cups as well as any other methods they come up with (e.g. using the multiplication table of 4). Then, several students share their solution methods with the class, the methods as well as errors are discussed and evaluated, and important ideas are highlighted. The teacher then uses these ideas to introduce the division algorithm for 14÷4, relating each step to the soldiers and the tents. Lastly, vocabulary words such as dividend, divisor and quotient are introduced and related to the problem. Solving and discussing this "anchor problem" has taken a little more than half of the one-hour math period. For the rest of the class, students solve and discuss a few carefully selected problems from the textbook, gradually moving from simple to more complex numbers, and using pictures from the textbook to help them form a mental picture of the process. Over the course of the unit, students will learn to calculate long division problems using only numbers but they will have frequent opportunities to move through this cycle of concrete manipulation to pictorial representation to abstract calculation. Since there are fewer topics in the Singapore math textbook, the students have sufficient time to study the concept in depth to understand and master it. I would like to point out a few reasons why this approach is helpful. 1) The problem situation provides a familiar context for students to think about an abstract concept. Although 14÷4 might seem easy to adults, for a third grader, especially one who is already struggling in mathematics, it may seem quite abstract. The use of a familiar situation makes it easier to understand. Every child can think about dividing toy soldiers equally into tents. Since no numbers are mentioned initially, no child is lost. Every child can enter the lesson successfully at some level. The problem setting also makes mathematical terms like divisor, quotient and remainder easier to understand. All too often, abstract mathematical concepts and vocabulary are presented in a void. But the problem situation gives the terms meaning. The toy soldiers become the dividend, the tents the divisor, the number of soldiers in each tent the quotient, and the soldiers who don't have a tent the remainder. When used in this way, instead creating difficulty, the word problem makes learning more concrete by presenting abstract ideas in a familiar context. As a result, students' attitudes towards problem solving and mathematics in general improve. their classmates will understand them. When they have to listen to their classmates' methods and restate their friends' thinking in their own words they learn how to listen to and learn from each other. 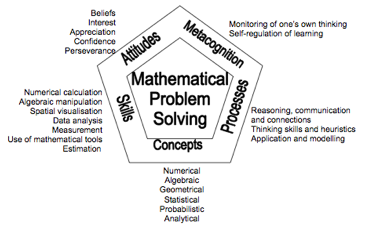 The pentagon from the Singapore Mathematics Framework shows how important reasoning, communication, thinking and metacognition are for students to become good mathematical problem solvers. to internalize and visualize mathematical concepts. The concept of division can be very abstract to children. Thinking about division using counters and cups is much easier than thinking about it with abstract numbers. By manipulating concrete objects, students internalize the division process. U.S. math programs often also begin with concrete activities but students usually go from using concrete objects right to abstract calculation. Singapore math textbooks include an intermediary pictorial stage. By looking at pictures of concrete objects being divided equally, students form a mental image of what long division looks like. When they finally get to abstract calculation, they have already internalized and visualized the process. in a developed East Asian nation). In Singapore math, traditional algorithms are learned but conceptual understanding is taught before procedural fluency. For example, the long division algorithm taught in Singapore math textbooks is the same one we traditionally learn in the U.S., but it is presented and explained quite differently than the way most of us learned it (see Power Point presentation below). In Singapore math, students not only learn how to do an algorithm but also why and how every step of the algorithm works. 2) Singapore math is not "drill and kill," facts memorization, or rote learning of procedures. In Singapore math, students learn their addition, subtraction and multiplication facts and eventually memorize them. But they also learn the structure and patterns behind the facts so if they forget them, they are able to reconstruct them in their minds. From early grades, children learn how to compose and decompose numbers and manipulate them in useful ways in order to calculate mentally. Singapore math is about students solving problems, thinking deeply, sharing their ideas, and learning from one another. Conceptual, procedural and factual understanding is developed through problem solving and carefully structured practice and as a result, students learn how to think deeply and appreciate mathematics. We cannot to go into sufficient detail in this blog about how mathematical concepts are presented in Singapore math so I am attaching a SingMathPPT.pdf presentation that will give you an idea of how basic algorithms and mental calculation are taught. (large file so download may take a couple minutes). In future posts, I will discuss the use of bar models for problem solving, and tips for successful implementation for schools that are interested in using Singapore math.